Pope Francis devoted much of his weekly speech on September 4 in Rome to the Syrian conflict. 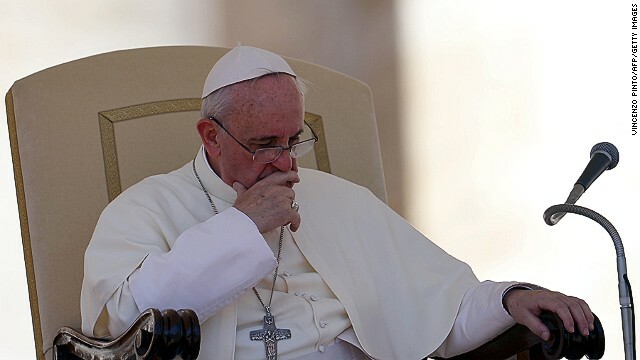 (CNN) - Pope Francis on Thursday wrote to the G-20 leaders, saying that military intervention in Syria would be "futile" and urging them to seek a diplomatic solution instead. "To the leaders present, to each and every one," Francis wrote in a public letter, "I make a heartfelt appeal for them to help find ways to overcome the conflicting positions and to lay aside the futile pursuit of a military solution." The pope's letter was addressed to Russian President Vladimir Putin, who is hosting the G-20 meeting, where the Syrian conflict is expected to take center stage. Francis has condemned the use of chemical weapons in Syria and called for a day of prayer and fasting on Sept. 7 to press for peace in Syria. He also chided the international community for letting "one-sided interests" prevent them from finding a solution. But while lamenting the "senseless massacre unfolding" in Syria, he has also rejected calls for a military strike against the forces of Syrian President Bashar al-Assad. The U.S. Conference of Catholic Bishops also urged President Obama and Congress not to use military force in Syria. "A central moral question is: Will more or less lives and livelihoods be destroyed by military intervention?" Cardinal Timothy Dolan of New York and Bishop Richard Pates, who represent the bishops, wrote to Congress on Thursday. "Instead of employing armed force," the bishops continued,"in this situation our nation, working with the international community, should direct all of its energies urgently and tirelessly toward dialogue and negotiation." What if Putin is correct? Did you see where the "moderate" rebels have taken over a Christian village northeast of Damascus? Torturing the priests. Vowing to level the place so it cannot "hurt" islam anymore? Admiral Nimitz would roll in his grave knowing that his ship would become air support for these throat-cutters. May a well run up the black Al Qaida flag up on the Nimitz. While regarding their religious continuities becoming liberally more fascist: Islam suppresses the women of Islamism via Islamic male infidelities being the dominant factors of Islamic women’s servitudes. Today’s so called Muslim Brotherhoods are but fascist bands of youth orientated Islamists seeking out socialized nationalistic power thru physically violent means as is nowadays being played out within the Middle East nations which is now the case in Syria….